Dr Laura Gardiner is a postdoctoral researcher at the University’s Institute of Integrative Biology. 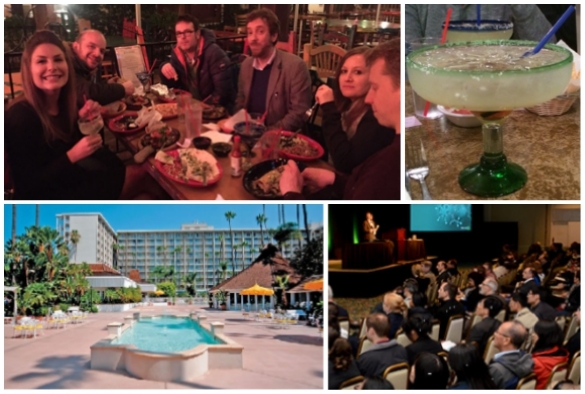 “I recently visited the Plant and Animal Genome XXIV Conference (PAG), held in San Diego, California, with my colleagues Professor Anthony Hall, Professor Neil Hall, Dr Alistair Darby, Dr Christiane Hertz-Fowler and Dr Ryan Joynson. This conference is well known for a diverse and plentiful selection of seminars and workshops that are delivered from 8am-8pm over the course of five days. With over 3000 attendees, PAG also attracts a large number of companies that attend to exhibit their latest technologies. During my visit I presented a poster on our recent work that led to the creation of the first map of the wheat epigenome. My colleague, Dr Ryan Joynson, also presented his recent work with the cyber-infrastructure developer iPlant and outlined the future direction of iPlantUK. Our research was well received and many students and researchers have shown an interest in collaborating with us or pursuing research in this field. In the evenings, after a full day of seminars, the central focus of this meeting became the bar. With Mexico in close proximity to San Diego, its influence is apparent and margaritas were a must! During this time, plenty of scientific discussions took place and new collaborations were founded.